Today's Guest Post is brought to you by my friend and fellow blogger, Liliana Plemons! We've known each other since high school and recently reconnected to run our website, Chronicles of a Foodie! She's a fellow foodie and was my guest at Cupcake Challenge LA back in February. 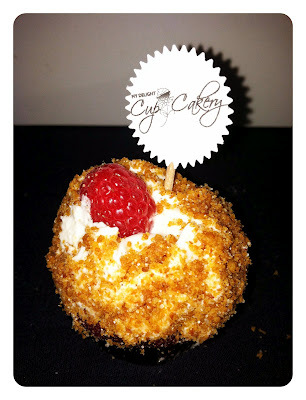 We recently interviewed My Delight Cupcakery on here on CTTC but here is Lili's review on My Delight Cupcakery's treats! Her original post can be found on our website here. When I picked up this mini cupcake from my box, I took a moment to appreciate the beauty and simplicity that went into designing a dessert that lived up to its flavor. The picture I took mostly captured the frosting and toppings, which in my opinion made My Delight one of my top three picks for best bakery. The first bite wasn’t even about the red velvet; it was the frosting that highlighted the whole flavor experience and party in my mouth! The frosting had the classic cream cheese taste but was swirled with visible little black dots that came from the fresh vanilla bean the bakers used. However, what really captured the cheesecake-like theme were the crunchy golden graham cracker crumbs that covered the entire surface of the creamy and decadent frosting. These elements alone would have sold me and given me enough reason to decide that this cupcake was glorious and the brilliant artists behind it deserved praise, but the awe wasn’t over yet. There was a middle ingredient I wasn’t aware of at first, between the frosting and the red velvet cake. They had been glued them together with a slightly tart raspberry jam that oozed out from under the frosting after each bite. 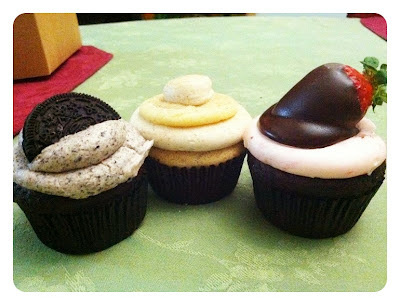 The fruit with the vanilla and the cocoa from the cake was the trifecta that all cupcakes should strive to achieve. On a side note, I hope this wasn’t too biased of me but a few days after the LA Cupcake Challenge I discovered that My Delight had a food truck and they were going to be in my area. I thought it would be well worth it travel to them and try out some of their other flavors in full-sized form, and man was I glad I did. Pictured above from left to right are the vegan cookies and cream, the snickerdoodle, and finally their flavor of the week the chocolate covered strawberry. Unfortunately the snickerdoodle flavor was not for me so I have no input on it other than its appearance made my mouth water. Anyways, as I’ve said in my ‘about me’ section of this blog, I will try anything vegan if it is available on the menu because I’m curious to see how vegan recipes can evolve and how creative chefs can get with them. This vegan dessert was outstanding and by no means did it shine any less in flavor compared to their dairy-filled options. It was creamy, light and crunchy and the frosting was an exact replication of the cream filling in a Nabisco Oreo. I was impressed and now have a whole new level of respect for their craft but that wasn’t the star of my night. The chocolate covered strawberry cupcake was fantastic and damn near evil. The chocolate cake and strawberry frosting met my high expectations of indulgent flavor, but the surprise was the fresh strawberries that hid so neatly and unexpectedly in the middle of the cake. Everything was a combination of juicy, soft and a little bit messy but I’m sold on these bakers and their ideas and in the future I will be going out of my way to stalk their truck when it drives through my town.